"[REED] Nathan, s. of Ebeneazer and Huldah, Jan. 3, 1719." Edward F. Johnson, Woburn Records of Births, Marriages and Deaths [5 Volumes], (Woburn, Mass. : The News Print, 1893), Volume 1, Births, page 205, Nathan Reed entry. Nathan Reed (1719-1802) was the third child of Ebenezer Reed (1690-1767) and Huldah Blodgett (1689-1777). He married Susannah Wood (1706-1783) in 1743 in Woburn, and they had two children. 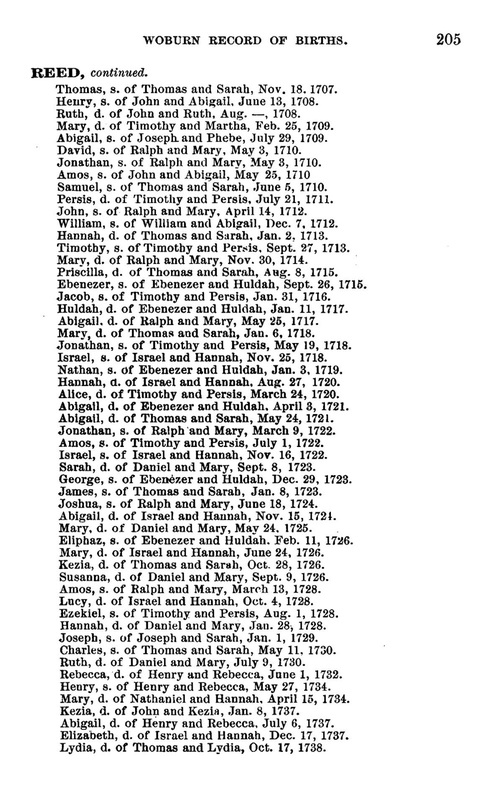 Nathan and Susannah (Wood) Reed are my 6th great-grandparents, through their daughter Susannah Reed (1745-1833), who married Simon Gates (1739-1803) in 1766 in Marlborough, and resided in Gardner, Massachusetts.